​Microbolometers, which are infrared detectors that operate at ambient temperature, were first developed for military and space applications. Today, the devices are making their way into driverless cars, where they are helping improve safety. LiDAR, radar, ultrasound, and other sensors that use visible light cannot quickly and reliably detect all obstacles in a vehicle’s path when visibility is low. Infrared sensors, on the other hand, detect the heat emitted by obstacles, making the sensors a crucial addition to autonomous vehicles. The unparalleled reliability provided by these sensors overcomes one of the main challenges to the widespread adoption of autonomous vehicles. Today, the thermal infrared imaging market is dominated by microbolometer technology, which strikes a very attractive balance between cost and performance. Leti, a CEA Tech institute, has been working on uncooled microbolometer technology since the 1990s. In 2002, a spinoff, ULIS, was created to commercialize the technology developed.  Today, France-based ULIS is one of the world’s leading providers of thermal infrared sensors. Uncooled microbolometer-based sensors manufactured from standard MEMS and semiconductor materials can enable truly remarkable performance improvements and lower product costs substantially. For example, pixel sizes have been reduced from 45 µm in the early days of the technology to 12 µm today, without altering performance.